Hand carved old world style custom double entrance door is built to last forever. Interior or exterior these extraordinary custom doors are built from solid cedar cypress, and include an intricate style and master hand carving that has been hand made by our dedicated craftsmen. 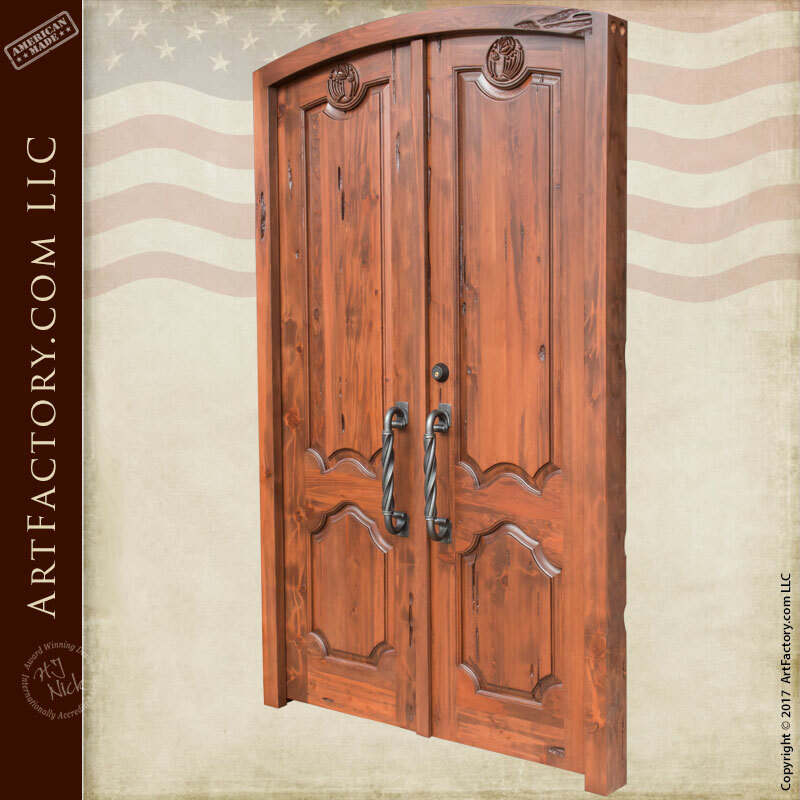 ArtFactory.com builds in original craft old world style doors using the same time honored techniques and craftsmanship as the originals they were inspired by. We take pride in creating the finest doors available anywhere. Handmade in the USA the old fashioned way, by our master craftsman. We hand make all exterior doors and interior doors, using mortise and tenon joinery ( not fast process glue and screws etc, in any size, style and finish to accommodate your residential or commercial entrance. Contact us with your entrance door size and style requirements, and we can build a custom entry door just for you, call 1-800-292-0008.
and craftsmen were proud to sign their work. Double Doors – As shown – Raise panels with raised panel style solid 3-inch thick custom double doors . Hand forged iron hardware, stationary door security slider bolts, adjustable threshold, self sealing sweep that raises and lowers automatically as you open and close the doors, roller style door latches, single cylinder deadbolt lock, weather stripping, and heavy duty self closing, tension adjustable hinges. All custom doors feature hand hewn, pegged and dowelled construction. Entrance hardware set features hand forged and anvil hammered solid wrought iron handle. The custom door handle is forged from four solid round rods twisted together at over 2000 lbs. torque, the ends are 1 3/4-inch solid balls with a patina finish applied at over 1200 degrees, available in all colors and is shown here in P-500 Patina Black.